Bella has had to post pone their opening date from this past summer to the fall of 2016. Due to unforeseen circumstances but the long awaited beauty lounge has officially opened for business and it is just as awesome as many were expecting it to be! This nail lounge is a beauty oasis. When you walk in you literally feel as if you’ve walked in to a room that has been dipped in gold. The beauty bar is tucked away on the corner ofTreat Place and Maiden Lane, and is lit up by multiple crystal chandeliers that hang from the ceiling. Gold porter chairs align the walls as available seating for incoming customers. Gold leather pedicure chairs accompanied by white ceramic pedicure sinks, that are sure to make you feel like royalty. And the nail polish…the variety is endless and it’s not stored behind your typical acrylic case with a lock and key… Nope. Bottles of Christian Louboutin nail polish, Essie, Opi, and many other brands all sit nicely on a display of acrylic shelves which line the wall vertically in the middle of a gold frame. Did I mention how the walls are adorned with a custom gold and neutral paint job, a work of art all in its self. The plush bar is equipped with custom gold and neutral bar stools serving up custom manicures instead of alcohol. Oh and the bathroom literally has custom glitter floors, and the walls are embellished with pink lip kisses. This place is heaven to a girl. And throughout the salon you will be sure to find crowns, tiaras, and handheld mirrors. It’s literally an oversize vanity for beauty and I love it. Ok now back to the grand opening; the room filled quickly with fellow community business owners, and future customers. P Scott Events set stand up tables around so guests can stand while sipping their Moet or sangria while listening to the live music provided by DJ XO. 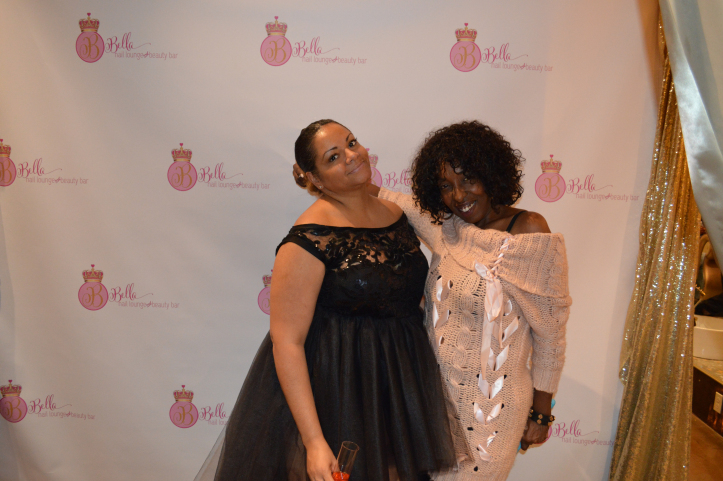 Attendees enjoyed sangria, Moet, spiked cupcakes, fried wings (Ambassador’s perhaps) , deviled eggs, cups of veggies with ranch dip, and turkey burger sliders. There were raffles and prizes of special Bella Lounge services. 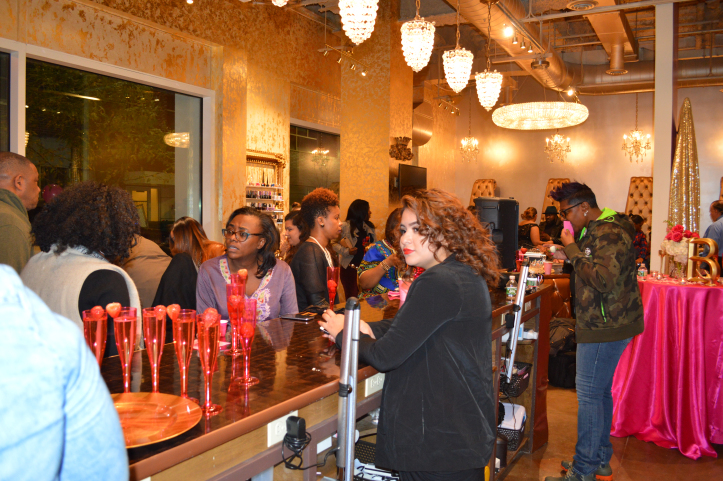 The salon was filled with great vibes and excitement for the upcoming luxury nail lounge oasis premiering right in down town Newark. The owner is of course Lisa Allen, the manager is Ms. Lulu Cooper, and the nail technicians are Mai, Michelle, Loren, and Shay. All grand opening decor was provided by P. Scott Events.